One of the current stars of South African rugby, Habana cemented his place among the sport's elite with a series of outstanding displays during South Africa's 2007 Rugby World Cup triumph. The 2007 IRB Player of the Year, Habana is regarded as one of the most lethal wingers in the game having taken the Springboks' all-time try-scoring record during the 2011 World Cup. He played centre and scrum-half throughout age-group rugby before moving to the wing where he would go on to make a huge impact. 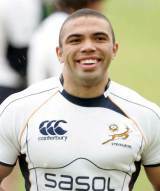 A Springboks 7s international, he was also the top try-scorer at the 2004 IRB U21 World Championship before making his Springboks debut as a replacement against England on 20 November 2004, scoring a try with his first touch of the ball. Blessed with electric pace, Habana started all 12 Tests for the Springboks in 2005, scoring 12 tries and establishing himself as one of the world's best finishers before being nominated for the IRB World Player of the Year Award. His two long-range tries against Australia in Perth helped the Springboks win their first Tri-Nations match overseas since 1998. Habana, who has been clocked at 10.2sec for 100m, made another ten appearances for the Springboks in 2006, one at centre, adding two tries to his international tally. Habana had an outstanding 2007 season that would underline his status in the game. The speedster made headlines around the world later that year by racing a cheetah - and not surprisingly losing - as part of an awareness campaign but he would later hit the headlines again doing what he does best. A last-gasp try for the Bulls in the Super 14 Final set up the match-winning conversion in a nail-biting clash with South African rivals the Sharks. He then went on to score four tries in the two-Test series victory against England later that summer. Injury ruled him out of the Tri-Nations, but the speedster was back in the Boks' line-up for their Rugby World Cup campaign. He scored four tries in their opening victory over Samoa and followed that with two against the USA and a further brace against Argentina in the semi-final. Unable to add to his tally of eight in the final victory against England, he had to settle for a share of the record for tries in one tournament that was set by New Zealand's Jonah Lomu in 1999. Two years later Habana was selected in the South Africa side to play the British & Irish Lions and he played in the first two Tests, scoring a memorable try in the second, as the Springboks won the series. He was rested for the third Test, which saw the Lions record a consolation victory. The series win was added to a second Super 14 title with the Bulls, secured thanks to a crushing victory over the Chiefs at Loftus Versfeld. Habana opted for a switch to Cape Town in 2010 to ply his trade with the Stormers and Western Province. He helped the Stormers claim their first Super 14 Final appearance but they saw their hopes dashed by the Bulls. He returned to action with the Springboks later in the year and with two tries in the series against Italy he drew level with Joost van der Westhuizen try-scoring record of 38. And Habana broke the Boks' try-scoring record in their 87-0 rout of Namibia in the 2011 World Cup. Despite struggling with form going into the competition, Habana took his spot on the wing and crossed the line for South Africa's third of an eventual 12 tries. Habana made his Currie Cup debut for the Lions in 2004 before switching to the Blue Bulls in 2005, appearing in their shock final defeat to the Cheetahs the same year. He also made his Super Rugby debut for the Bulls in 2005 and featured strongly as they made that year's semi-final play-offs before losing out to the Waratahs.